The Division has finally received its new free update today, and players can enjoy the many changes and fixes included in it on all formats. 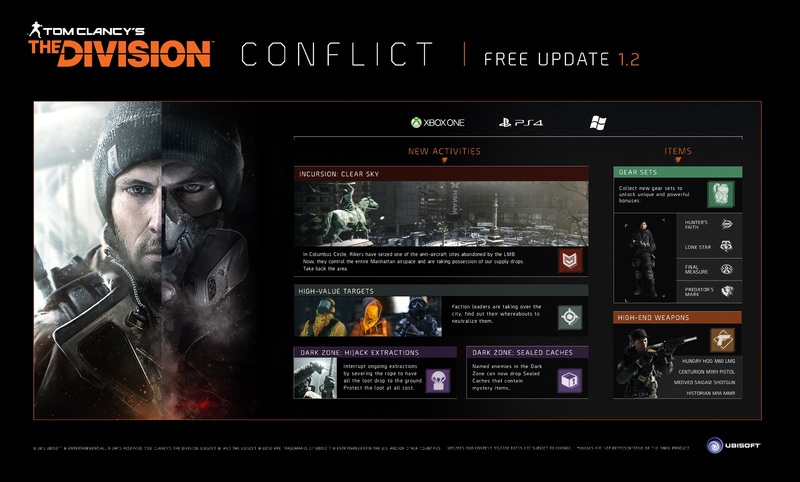 As it usually happens, The Division 1.2 update also includes a variety of tweaks and changes that haven’t been mentioned in the official patch notes, and it’s up to dedicated users to inform the community about them. A few hours ago, reddit user WoWAltoholic has put together a list of undocumented changes which confirm the addition of over one hundred purple Superior Items to the Dark Zone Gear Vendor, the changed crafting cost for weapon and gear mods and more. Historian Named Markman Rifle on sale in the Special Gear Vendor along with 2 pieces (each) of the new gear sets. In addition some pre-rolled holsters are available (you can get 3 pc Predator’s Mark instantly if you have the PxC) Side note, all the gear on this vendor was reset as a result. HVT Critical areas may not appear if it “spawns” on one of the zones you have not unlocked. It is also prone to bugging out and not appearing after you complete the current critical area. Relogging fixes this. #andmanymore was non-gameplay related changes. The Division is now available in all regions on PC, PlayStation 4 and Xbox One.